Lake Mead in Black Canyon shows the “bathtub ring” of bleached rock exposed by low water. Photo by John May. During my vacation, I passed through Las Vegas. Because Lake Mead is such an important part of the California water story, I drove out to see the famous “bathtub ring” for myself. I thought you might like to see some photos of what I saw. Lake Mead is, indeed, low. As I write (10/22/15), the lake is at 1076 feet above sea level, 143 feet below full pool. It is the lowest level on this date for the last 10 years. By volume, the lake is 63% empty and 37% full. 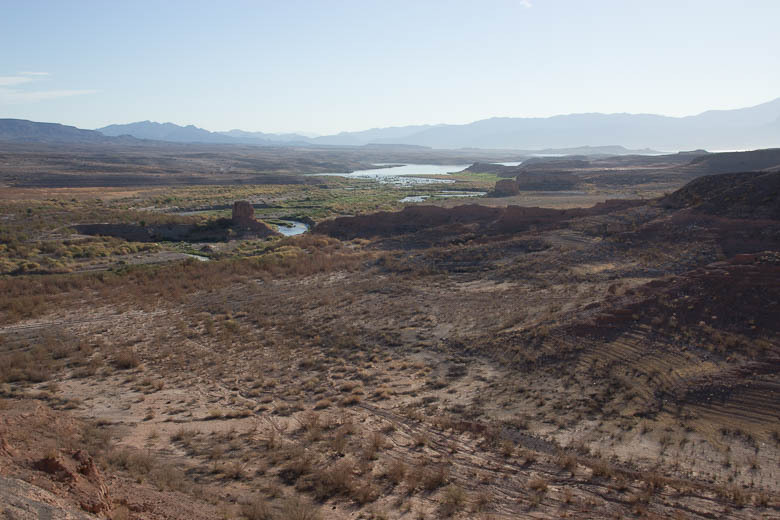 Since the lake was filled, the average elevation for this date is 1164, so it is 88 feet below its normal level for this date (Lake Mead Water Database). The first photo at right shows Lake Mead in Black Canyon, just upstream of Hoover Dam. The pontoons in the water are to keep boats away from the dam. The rock is normally black. The white area is rock that has been bleached by the waters of Lake Mead. Normally, it is underwater. It is hard to get a sense of scale in this photo. 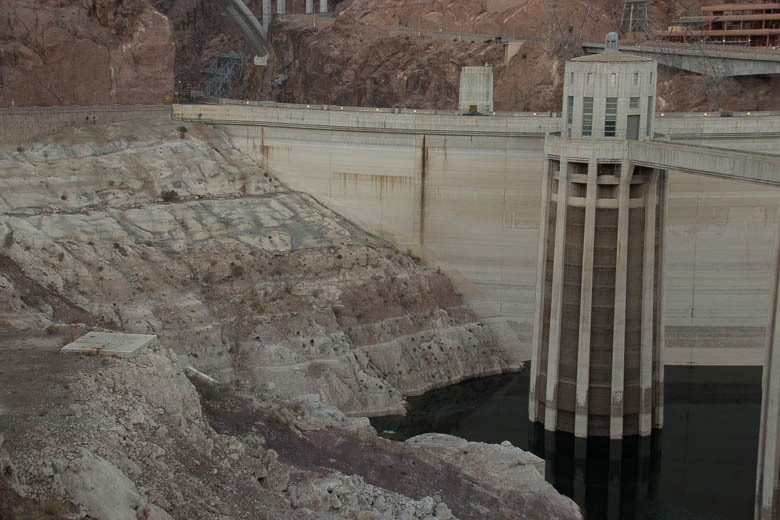 At Hoover Dam, low water in Lake Mead has exposed bleached rock that used to be covered by water. Photo by John May. The second photo shows the “bathtub ring” and part of the dam. If you look carefully, you can see a concrete structure on top of the dam to the left of the intake tower. A black car is passing in front of the concrete structure, and you can use it to get a sense of scale here. The water should come almost all the way up the dam. 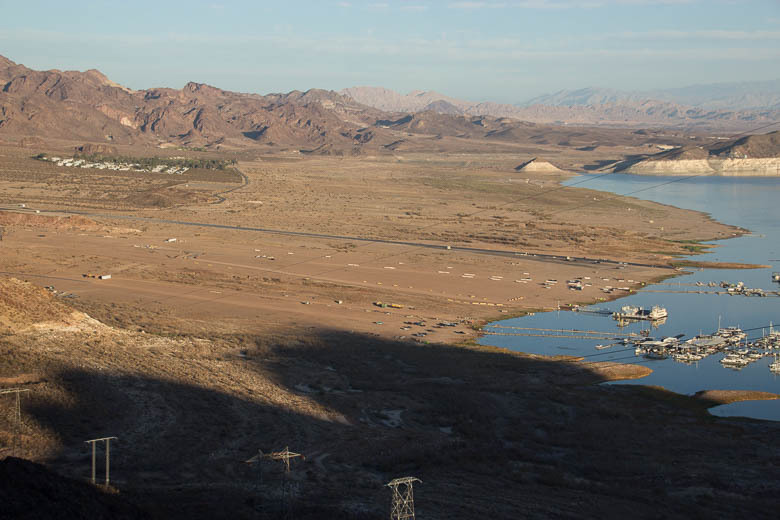 The third photo shows the Lake Mead Marina and the “beach” that has been exposed by the falling water. Full pool is just below the road that goes off into the distance. When the lake is full, most of the brown area below the road is covered by water. The old Las Vegas water intake has almost been uncovered by the low water level. Photo by John May. The fourth photo shows the water intake for the Las Vegas Valley Water District. The district provides water to more than 1 million people living in the area (Wikipedia). 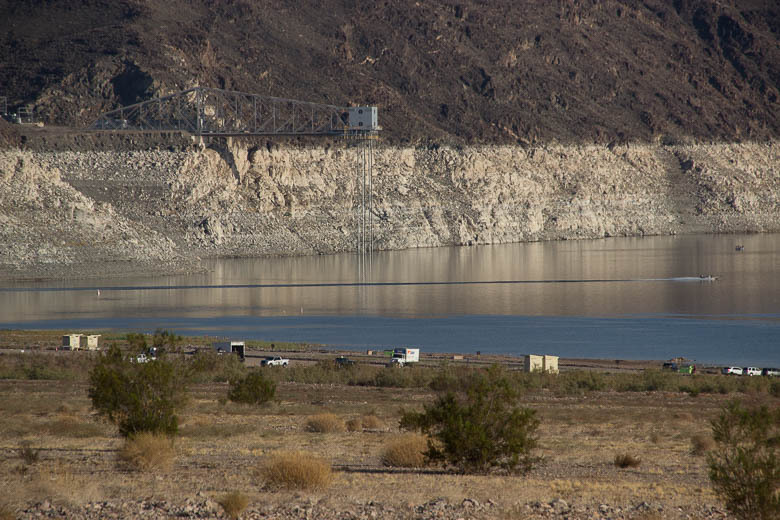 As you can see, the water of Lake Mead usually comes to just under the structure on the end of the metal arm. But it is far lower now. In fact, it is so low that the end of the metal pipes, which function like straws in a glass of water, are in danger of being uncovered. On 9/24/15, the water district finished construction of a new intake pipe that has its intake some 218 feet below the lake’s current level (CBS News, 9/24/15). 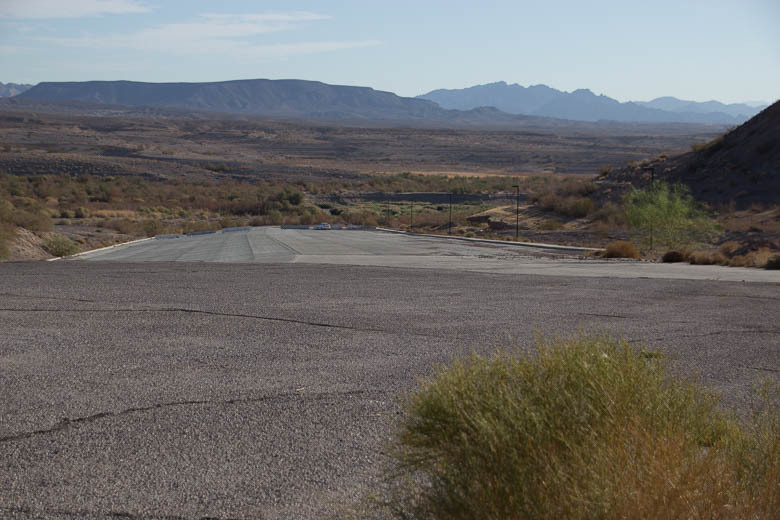 Las Vegas Bay Campground, once perched on a hill overlooking a scenic bay, is now about a mile from the water. Photo by John May. The boat ramp at Las Vegas Bay is high and dry. Photo by John May. The fifth and sixth photos show the area at Las Vegas Bay. This is a campsite and boat-launch area. As the fifth photo shows (left), the boat ramp is high and dry, no water to be seen anywhere. In the sixth photo (right), the sandy area at the bottom is the area just below the boat ramp. You can see the lake about a mile away around the corner, with a small creek coming up what is ordinarily the bay. About half way up the slope at right you can see a point at which whiter rock and sand below give way to darker rock and sand above. This is the normal level of the lake. Water usually covers everything, all the way across to the other side. CBS News. 2015. 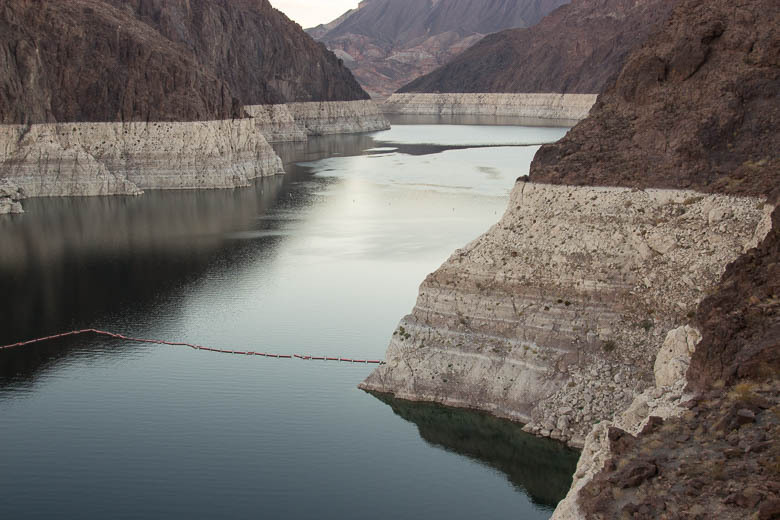 Las Vegas Uncaps Lake Mead’s “Third Straw” for Water Supply. Viewed online 10/22/15 at http://www.cbsnews.com/news/las-vegas-uncaps-lake-meads-third-straw-for-water-supply. Lake Mead Water Database. This in an online data portal providing information about the water level of Lake Mead. If you access this site, be careful about the date in the top heading of the webpage. For some reason, it does not seem to update properly, while the rest of the information seems to update properly. The date of the most recent measurement is given as the top value in the list of recent measurements. Accessed online 10/20/15 at http://lakemead.water-data.com. 2015. Las Vegas Valley Water District. Wikipedia. Accessed online 10/20/15 at https://en.wikipedia.org/wiki/Las_Vegas_Valley_Water_District. By mogreenstats in Climate Change, Consumption and Supply, Other Climate Change, Water on 2015/10/22 .